From the keynote speaker through to the award winners and finalists, Dalhousie had a big presence at the 11th annual Discovery Awards last Thursday night. The awards, organized by Halifax’s Discovery Centre, bring together Nova Scotia’s best and brightest for a celebration of science, technology and innovation. With a crowd of more than 400, the gala not only brought home the importance fostering a love of science among Canada’s youth, but demonstrated how it’s possible to realize scientific potential right here in Nova Scotia. Dal made its presence felt in a number of ways. Jeff Dahn, internationally renowned energy expert and professor in Dal’s Department of Physics and Atmospheric Science, was the event’s guest speaker, discussing the transformative possibilities of scientific education. Both of the Hall of Fame inductees — Jock Murray and the late George Geoffrey Meyerhof — were from Dalhousie (in Dr. Meyerhof’s case, the former TUNS). And the awards themselves featured six Dal finalists and two wins. The first of these wins was the Professional of Distinction Award, which went to Noni MacDonald and Michael Graven, both professors of pediatrics at Dal and clinicians at the IWK Health Centre. (In fact, Dr. Graven couldn’t make the ceremony because he was on-call in the NICU in the hospital). Dr. MacDonald is an international expert in vaccines for children, youth and pregnant women and in MicroResearch (growing interdisciplinary community directed research capacity in East Africa). Dr. Graven’s expertise is in designing and developing health information systems. Together, they’ve developed such a system — patient-centred, fully integrated — which has been implemented countrywide in several Caribbean nations, including Belize, Barbados and St. Vincent and the Grenadines. The system allows health-care practitioners and hospitals to share all patient information in real time and also includes embedded evidence-based patience care guidelines to help practitioners provide better care. Since its implementation in Belize, the maternal mortality rate has dropped to zero, and the number of hypertension-caused stroke and heart attacks has been by more than half. The system’s success can also be seen in the impressive uptake by health-care workers, with more than 90 per cent of health encounters being entered into the system in less than a year. “It’s a system that helps them practice better care, faster and the built-in feedback loops help the government see where health-care bottlenecks and problems are and how they might be addressed,” says Dr. MacDonald. As for the award, Dr. MacDonald says it’s great to see their international health-care work recognized in Nova Scotia. There was no suspense as to whether a Dalhousie project would take home the Innovation Award: all three of the finalists were from the university. With Computer Science’s Srini Sampalli and Dentistry/Biomedical Engineering’s Daniel Boyd in the running, the award went to the SENSELab, a research facility affiliated with several Dal departments, in particular Biomedical Engineering. The SENSELab (Sensory Encoding and Neuro-Sensory Engineering) brings together engineering skills and clinical practice to develop new ways to diagnose and treat disorders of the ear, audition and balance. Its members include Dal faculty Manohar Bance (otologist and ear surgeon), Jeremy Brown (ultrasound researcher) and Rob Adamson (optical diagnostic imaging researcher), who was at the ceremony to accept the award. The lab’s genesis came from Dr. Bance’s dissatisfaction with existing methods for treating hearing loss and a desire to develop new approaches. Through their work together, the lab’s members have constructed several new medical instruments, filed 10 patent applications, signed IP license agreements with three international companies and created three spin-off companies. Two of its biggest developments have been an implanted bone-conduction hearing aid to treat conductive hearing loss and new diagnostic tools to identify middle-ear hearing loss. “The bones and muscles are too small to see on a CT or MRI scan, so we’ve been trying to address that,” says Dr. Adamson. Alongside the competitive awards, the night’s two inductees to the Discovery Centre’s Hall of Fame both have long Dalhousie histories. The late George Geoffrey Meyerhof joined the faculty of the Nova Scotia Technical College (later TUNS, now part of Dalhousie) and served as dean of the Faculty of Engienering from 1964 until 1970. He was renowned for his research in geotechnical engineering, with extensive studies on social mechanics and the bearing capacity of foundations. He authored over 200 papers and earned honours including the F.H. Sexton Award and a Fellow in the Canadian Academy of Engineering. He passed away in 2003. Thomas John Murray — known to most as “Jock” — is a world-leading expert in multiple sclerosis research. A former dean of the Faculty of Medicine, he founded and then directed the Dalhousie Multiple Sclerosis Research Unit for more than 20 years and is the author of the award-winning book Multiple Sclerosis: The History of a Disease. During his time as dean, he established the medical humanities program and he has received many awards including the A.B. Baker Award for Lifetime Achievement in Neurologic Education from the American Academy of Neurology. Emerging Professional: Mather Carscallen is a PhD candidate in Marine Biology and Mathematics at Dal and the founder, president, CEO and principal researcher of SABRTech Inc., a Halifax-based company that develops commercial production of micro-algae. 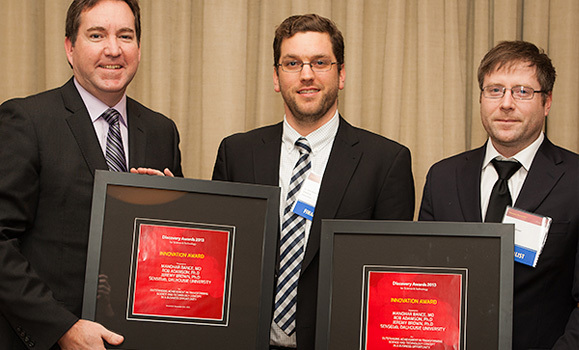 The company placed first in the 2011-12 Nova Scotia Clean Tech Open. Innovation Award: Daniel Boyd is one of the founders of ABK Biomedical Inc., which develops next-generation products to treat benign tumors of the uterus. The beads developed by ABK successfully cut off blood supply to tumours without the toxic dyes required so that current methods of treatment can be viewed by X-rays. Dr. Boyd, cross-appointed between Dentistry and Biomedical Engineering, won the first Bioinnovation Challenge in 2011. Innovation Award: Srinivas “Srini” Sampalli is a professor in the Faculty of Computer Science who has led breakthrough research in wireless technology resulting in the creation of a stateup company (Wi4Tech) with his students. The group’s system integrates smart phones equipped with a near-field sensor as well as cloud computing facilities. It has three solutions heading for commercialization at the moemnt, related to allergy and drug interaction, emergency services, and social networking. Science Champion: Jeff Hoyle is a professor in the Department of Environmental Sciences in the Faculty of Agriculture. He’s been involved in science fairs at the regional and national levels for more than 30 years, devoting hundreds of hours annually to ensure students in these fairs get appropriate trained scientists and engineers with whom they can discuss their projects. He also volunteers for Youth Science Canada.